It’s that time of year again! Time for all the fabulous foodies, kitchen queens and budding sommeliers to come out and celebrate the unique tastes of our wonderful country, and experience delights from further afield. At Crowne Plaza we are excited to be the proud accommodation partners of the Perth Food & Wine Expo. From Cheese Lovers Appreciation Classes, to Wine Masterclasses, exhibits from local producers and live cooking demonstrations the weekend of October 9th to 11th is sure to go off with a bang! With a special appearance from Gusti Restaurant & Bar Head Chef Vikas Chandra the yearly Perth Food & Wine Expo, held at the Perth Convention & Exhibition Centre on Perth Foreshore is an event not to be missed! Do you know who else loves food and wine? Our Head Chef, Vikas Chandra! Chef Vikas was welcomed into the Crowne Plaza family in 2013, after making the trip from India to Port Douglas in 2009 to continue his foray into fine food. At Gusti Restaurant & Bar, overlooking the gorgeous foreshore, Chef Vikas takes control of the kitchen and our palates, conjuring up dishes that dance across your taste buds, whilst still being fresh, healthy and innovative. His menu is a Modern Australian affair with Indian touches, and the team always aims to take advantage of locally sourced and supplied ingredients. We are very pleased to announce that Chef Vikas will be cooking his delicious new dish incorporating locally sourced and supplied ingredients live for audiences at the Perth Food & Wine Expo over the October weekend. 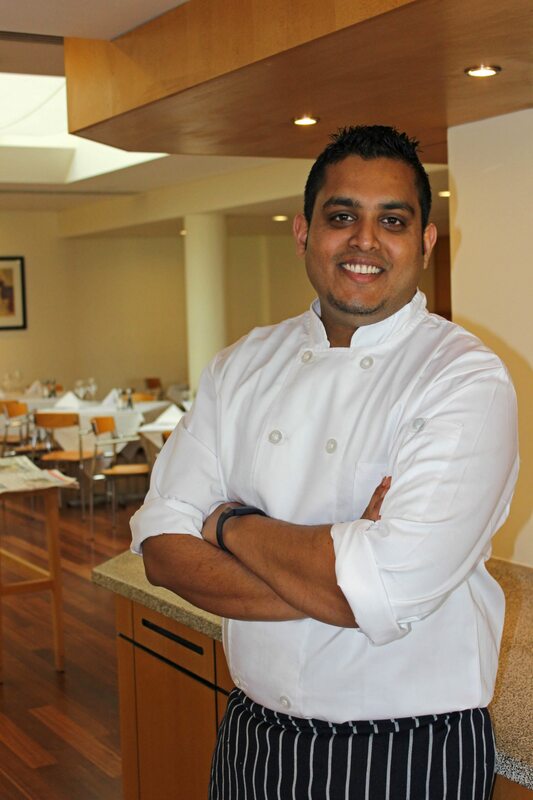 Chef Vikas Chandra will be front and center on the Celebrity Stage whipping up his Indian Spiced Soft Shell Crab served with Granny Smith, black chickpea salad, coriander chutney and tamarind gel. You will be able to see him live at 6.30pm on Friday 9th of October and at 4.00pm on Saturday 10th of October. Come and spend the night with us over the weekend of the Perth Food & Wine Expo throughout the 9th to 11th of October and you will receive two complimentary one day passes to the festival. What better way to treat your loved one to something special? We are located within walking distance of the Perth Convention & Exhibition Centre – while you walk along the riverside, you’ll be able to take in the tranquility of the Swan River and gaze out across the sailing boats to South Perth. Check out our Spring Specials now to book your stay!